When I first starting watching MMA five years ago, my relationship to the sport was precarious. I watched my first fights with a mixture of dread and repulsion that at all times threatened to overwhelm my interest and sabotage my curiosity. I loathed violence and the kind of people it seemed to spring from, so anything that smacked of angry, shaved-head, meathead, tough-guy, trash-talk boorishness would have only confirmed my worst suspicions about the sport and had me looking for a way out. Thankfully, the first fighters I fell for were Fedor Emelianenko and Anderson Silva, two quiet, modest-seeming men who seemed about as far away from the kind of frat-guy nonsense I associated with cage fighting as possible. Their behavior gave me an excuse to stick around. Five years, hundreds of fights, and one career as an MMA journalist later, I’m still of the mind that the only way to approach mixed martial arts is as a sport like any other, free of the ridiculousness that we also associate with fighting. That doesn’t mean I want my fighters dispassionate, but that I want them motivated more by the need to win than the desire to defeat. My love of fighting isn’t justified by the two people fighting not liking each other. I have no interest in the promotional politics of personal animosity. And the thing about it is, oftentimes the more two fighters trash-talk each other before the fight and give voice to their hatred (whether real or fabricated to sell tickets), the worse their fight is. UFC President Dana White said as much this week in an interview with Ariel Helwani: Squabbling fighters often make for the worst fights. Look at last weekend’s dreary affair between Jake Ellenberger and Rory MacDonald. They'd spent the weeks building up to it tearing into each other via Twitter and press conference call. These guys just don’t like each other, the press reported breathlessly, a story the fight press has delighted in reporting breathlessly for as long as there's been a fight press. But it turns out not liking someone is no guarantee that you’re going to actually fight them when the day comes. And when Ellenberger and MacDonald, so full of hate, danced around each other for 15 minutes, it only confirmed the theory that MMA defenders and promoters have been pushing for years: that there's no inherent connection between violence and hatred. Maybe fighters lose some of their killer instinct every time they utter a bad word against an opponent, and maybe there’s only so much killer instinct a person can have inside, and maybe if enough words are spoken there’s nothing left come fight night. I don’t know. All I know is that “Rampage” Jackson and Rashad Evans cultivated an epic hatred for each other in the years leading up to their fight, and when their fight finally came it was barely a fight at all. 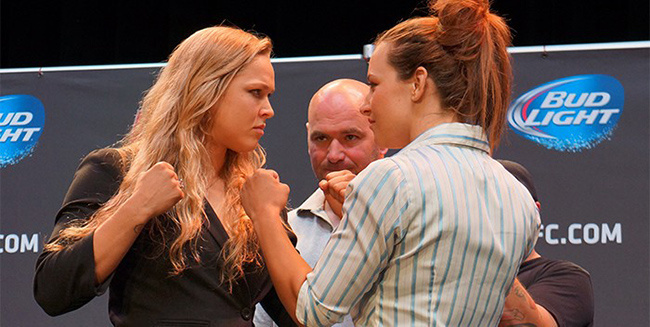 So, I’m a little worried about all this energy Ronda Rousey and Miesha Tate are expending making sure the world knows they hate each other: With every raised middle finger, every snarky Tweet, and every cranky SportsCenter roundtable I worry that they’re setting their rematch up for failure, that by that point both fighters will be so afraid of losing, having built up their mutual animosity into a living thing, they won’t fight to win. That their fighting instinct will have been squandered on chatter. It’s happened before. Maybe this has more to do with my personal prejudices and distastes than anything else. Street fighting, bar fighting, fighting motivated by anger and the desire to humiliate, fighting that imposes itself on strangers, that ruins nights and gives voice to the worst and most narcissistic human impulses—that kind of fighting I want nothing to do with. MMA is the most beautiful thing around, fighting the ugliest. So when I watch two MMA fighters puffing out their chests and opening their mouths and mocking their opponents after they beat them, I'm reminded of myself five years ago--curious but ready at a moment’s notice to run for the hills the first time the sport reminded me of why I hated violence in the first place.